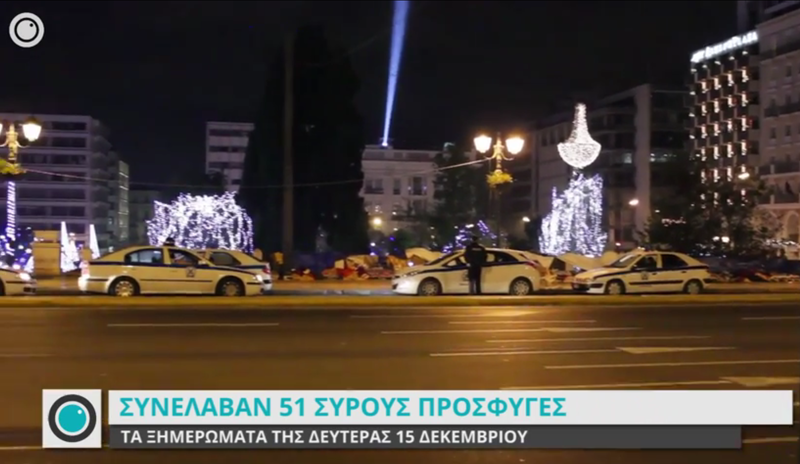 Fifty-one Syrian refugees, among them six women and two children, who were sleeping out on Syntagma Square as part of a protest that started almost a month ago were removed by police in the early hours of Monday morning and reportedly taken to the aliens department on Petrou Ralli street. According to a solidarity committee that has been supporting the Syrians, a contingent of police arrived to where the Syrians were sleeping at around 2.45am and quickly ordered them into a waiting police van. The same reports said that some of the Syrians were taken away barefoot as they had not been given time to gather their belongings, including important papers and documents that they had stored in bags. The committee said one Syrian was struck in the mouth and left bleeding. A short time later, municipal cleaning crews arrived and removed the Syrians belongings and dismantled the temporary structures they had erected. The Syrians began their protest on November 19 in order to highlight their predicament as refugees. They are seeking ways to continue their journeys to preferred destinations in Europe, where many have family or can expect to receive the necessary support as refugees. The Greek authorities have said they can accept up to ten asylum applications from Syrians per day but warned that apart from access to healthcare, the state is not in a position to support the Syrians in any other way. Some days ago, a number of Syrian families were taken to municipal hostels, where they have been accommodated. According to YouTube, this video was most-watched in Greece in 2014. 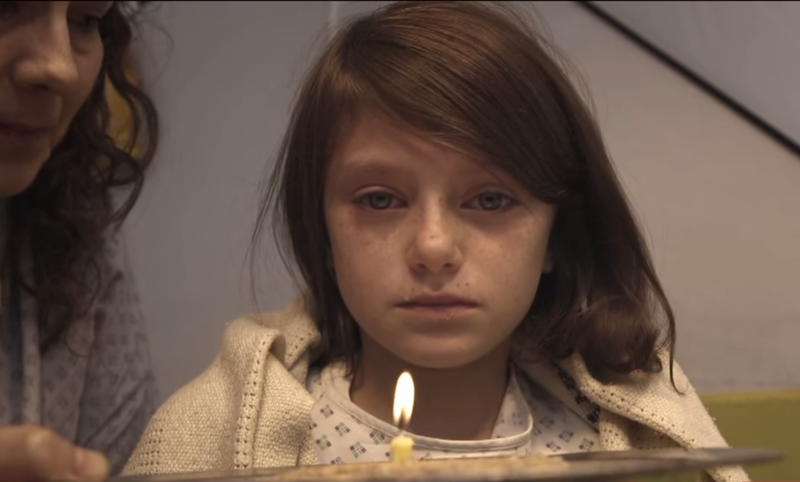 Made by Save the Children UK, the tragic second-a day clip shows what could happen to a young girl’s life were war ever to break out in Britain. Over the past few weeks, I’ve spent many hours talking to the Syrian war refugees who have been protesting their plight on Syntagma Square in Athens since November 19. 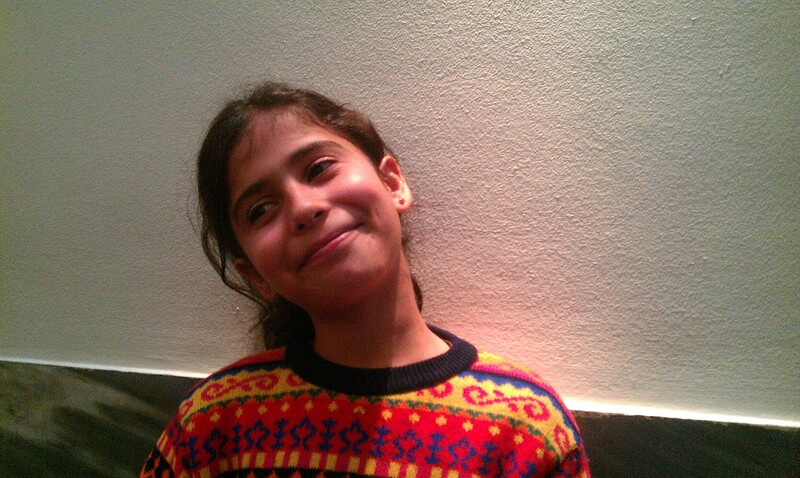 The Save the Children video doesn’t even come near to describing what Mariam, a wonderful nine-year-old girl, has experienced in the three years since her mother was killed in Damascus. Yet, after an ordeal that has taken her and her father though wartorn Syria, Lebanon, Turkey and now Greece, all that’s on offer for them, as they’ve been told, is asylum in Greece without any support whatsoever. A cynical offer, one that would effectively leave them homeless and destitute and without the support of relatives (in Germany and Sweden) that she and her father need. Is that the best the EU can do for these people? Isn’t it time to translate the public’s sympathy for the plight of children made refugees by war – as the popularity of the hypothetical British video in Greece suggests – into concrete action to help the Syrian refugees? That my native country of Ireland should feel somehow satisfied that it has resettled 201 Syrians and has plans to take in 220 more – out of a total of 3,200,000 Syrian refugees – is shameful when one considers that Greece receives that number and more every few days. Europe’s human rights court is expected to issue a decision early this week on an emergency case taken on behalf of some of the hundreds of Syrian refugees who have been camped out in central Athens to highlight their plight for almost three weeks. The Syrians, among them many unaccompanied minors, families with young children and elderly, last night completed their 19th night camped out on Syntagma Square, with only rudimentary plastic sheeting to protect them from the rain and low temperatures. They took the decision to protest in front of the Greek parliament on November 19, in an attempt to convince the government to find a solution to their acute problems. Since then, some of the protesters embarked on a hunger strike. The application to the European Court of Human Rights (ECtHR), taken in the name of 30 Syrians, maintains that the refugees, who risked their lives in fleeing their war-torn country and in reaching Greece, should have been given automatic protection upon their arrival in Greece, according to national, European and international standards. This would also mean that they be afforded reception conditions in terms of housing, food and other support. The decision from the Strasbourg-based court could come as soon as Monday or Tuesday, according to human rights lawyer Electra Leda Koutra, who submitted the case under the court’s rule 39 on interim measures, which are urgent measures that apply only where there is an imminent risk of irreparable harm. Among the 30 Syrians seeking the interim measure is a 12-year-old child who is an unaccompanied minor. A “holder of a Syrian passport, he has been left without information, without any kind of support, guardianship or monitoring, on the Greek streets, after having been considered ‘deportable’ to a war zone”, the application states. Although the child has indicated that he would consider applying for asylum in Greece, he has said this would be conditional on him being promptly reunited with his brother, a recognised refugee, in Sweden. However, any such applications from unaccompanied minors would take at least eight months to process, according to the application to the court. Although the government has said it could process up to ten applications for refugee status a day, the application to the ECtHR argues that this is a wholly inadequate response to the situation as it envisages offering homeless refugees no accommodation or support in the meantime and would thus leave them to fend for themselves and exposed to racist attacks, among other dangers. The application also maintains that what Greece is offering to the Syrians in terms of reception conditions should they obtain refugee status is unacceptable under the country’s international obligations. In a leaflet, interior ministry officials told the Syrians that only a few women with small children would be accommodated in a hosting facility, and no subsistence or other support would be possible, “because of the Greek state’s financial crisis”. “That documents admits in the most public – but also cynical – way that Greece cannot offer the reception conditions guaranteed by the CEAS [Common European Asylum System] on EU ground. No housing, no food, no clothing, no social and integration services are to be automatically offered, despite the opposite legislative guarantees,” Koutra told A Gael in Greece. She adds that under Greek presidential decree 80/2006, which transposes into national law European Council directive 2001/55, the country may offer temporary protection to refugees without obliging them to apply for asylum. This would require the permission of the European Commission and Council, but Greece would need to propose it. As the Strasbourg court has been informed by the lawyer, all the other Syrian applicants named in the case have said they will refuse to apply for asylum in Greece. The overall situation pushes Syrians into taking unconventional ways to reach safe EU countries, the application points out, putting their lives in great danger in the process. Already, two Syrians who were part of the Syntagma protest have died while attempting to make it to western Europe on foot, including a doctor, Ayman Ghazal. On Monday, one of the Syrian protesters provided A Gael in Greece with the names of four other Syrians who died recently died after leaving Greece in forests of neighbouring countries: Nizar Sourki, who died in Macedonia, and Mohammad Aryan, Ismael Alahmad and Khaled Husain Basha, who died in Albania. The application points to a series of ECtHR rulings that established that asylum seekers have been left in an extremely vulnerable situation and humiliated in Greece due to the failure by the authorities to act on its obligations under the EU’s reception directive. Other rulings from the court have found that asylum seekers have been subjected to “degrading treatment” in the country’s detention centres. These rulings effectively prohibit a number of EU countries from deporting asylum seekers to Greece. “We are of the view that, accepting to ‘gradually’ apply for asylum at this stage (as protesters), just for the ‘title’ of it, without the rights and benefits escorting the status of an asylum seeker, does not constitute an effective remedy for the applicants, in the meaning of the [European human rights] convention. It would not move them to a position of safety, and it would not redress the rights the applicants are complaining about. Moreover, it would take about two months for all the protesters to be registered, which would mean that, besides their guaranteed rights, they would have to spend winter in the Athenian streets, in a situation that is menacing their lives, bodily and mental integrity –not to mention their dignity as human beings,” she explained to the court. Koutra hopes that whatever the outcome, the decision from the court will be extremely important. She points out that on November 26, two days after submitting her application, the ECtHR responded promptly and, applying an urgent procedure, requested the Greek government to clarify a number of points regarding the Syrians by December 5. Firstly, the court asks the government to describe the situation the Syrians find themselves in. Second, to clarify on what measures it envisages for particularly vulnerable Syrians, such as women with young children and unaccompanied minors. Thirdly, it calls on the Greek government to explain how it intends to process asylum applications, and, finally, to explain in what conditions the asylum applicants would be obliged to wait while their applications are being processed. A doctor who was part of the protest that Syrian refugees started two weeks ago in Athens to highlight their plight has died trying to cross the Greek–Albanian border, other Syrians at the protest said on Thursday. They named him as Dr Ayman Ghazal, who was around 50 and originally from Aleppo. Friends said that after spending a ten days at the protest, he felt it was in his best interest to continue his journey to northern Europe and what he hoped would be safety. According to the Deport Racism website, the doctor had tried to cross the Greek–Albanian border with a group of 30 people. They had taken a bus to Ioannina, in Epirus, and from there they reached Kakavia border crossing by taxi. From there, they started to walk towards the border. After a four-hour trek, they came to a stream which they had to cross, up to their waists in water. Sometime later, Dr Ghazal had a seizure. When his friends phoned for an ambulance, they were told to return to Kakavia. The police also told them the same thing. His comrades then set off for Kavakia, carrying Dr Ghazal on a sleeping bag. Outside Kakavia, they came across an ambulance, which transported him to the nearest hospital, where he died. The rest of the group are now back in Athens. Abdulghafour Tammaa, one of the protesters on Syntagma, tweeted that Dr Ghazal had died in an Albanian forest “of the cold”, adding that his “dream of Europe” had perished with him. According to a post on the Facebook page of the Syrian protesters, the dead man’s family are in Mersin, Turkey. About 200 Syrian refugees, among them elderly, women and children, have been camped out on Syntagma Square in central Athens since November 19. The numbers at the protest swell during the day with other Syrians who have accommodation elsewhere. The Syrians want to be allowed continue their journeys to countries they say will guarantee them protection as war refugees. According to EU rules they must apply for asylum in the first EU country they enter, but the Syrians say that Greece has no infrastructure to support them. Dr Ghazal’s death highlights the perilous nature of the journey war refugees and other migrants take in their desperate attempts to reach safe countries. In November, eight migrants were killed when they were hit by trains in neighbouring Republic of Macedonia while another man, a 23-year-old Afghan, died when the board he was strapped onto beneath a train broke. Last night, their 16th camped out on Syntagma square, Syrians and their supporters lit candles and held up photographs of Dr Ghazal in his memory. My article in yesterday’s Irish Times on the protest of Syrian refugees on Syntagma Square in Athens generated a mixed response on Facebook, where, among other places, I posted it on the page of the sadly defunct Athens News. The Syrians, among them dozens of children, including a baby, have completed their sixth night sleeping outdoors. Yesterday, a number of them commenced a hunger strike. They want Greece to allow them continue their journey to other EU countries where many have family or know they will receive protection. From the comfort of their keyboards, a number of commenters on the Athens News page expressed their view on why Syrians deserve no help from Greece, with common arguments being that Syrians are somehow incompatible with Greece or Europe for religious reasons (an opinion shared by a number of expatriate Greeks) or that Syrians should seek refugee with neighbouring “Arab/Muslim” countries. It seems they are unaware of the facts: the statistics show that the vast majority of Syrian refugees have sought refuge in Lebanon, Turkey, Jordan, Iraq and Egypt. One commenter, possibly from Syria, reminded them, however, that there was time when Greeks sought refugee in Syria by posting a photograph from the Library of Congress photo archive. The undated photo, entitled “Greek refugees at Aleppo”, shows a group of raggedly dressed people, young boys to the fore, lined up, waiting to be fed. In the foreground, a woman, with a can of some sorts at her feet, stands next to a cart on which something is being cooked. 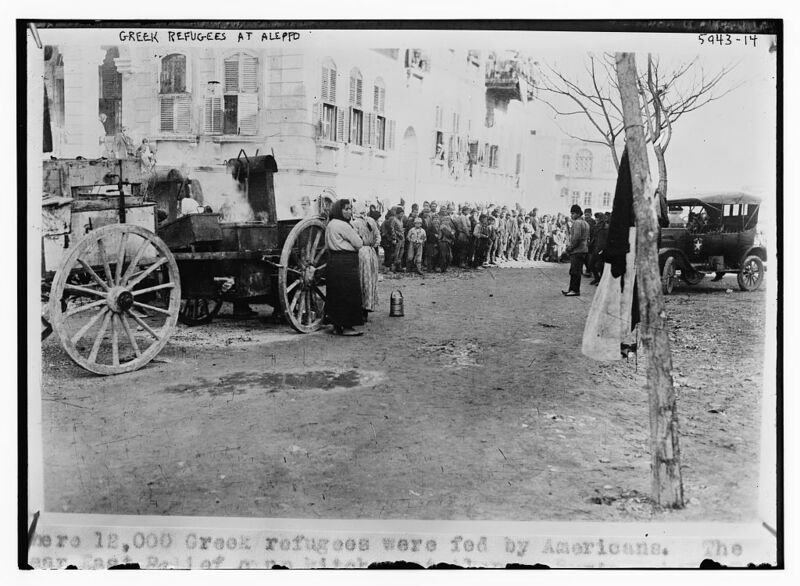 Underneath the scanned photo, what’s left of a caption states “12,000 Greeks were fed by the Americans”. According to one account of the forced exchange of population between Greece and Turkey (full book here), as agreed under the 1923 Lausanne treaty, there were 17,000 Greek refugees from Asia Minor in various Syrian cities. So grave was the situation, that in August 1923, the head of the Greek refugees in Aleppo cabled the foreign ministry in Athens, requesting that it prohibit any more Greeks from reaching the city, where “it has become impossible to admit further refugees”. No doubt, just as the Syrian refugees protesting in Syntagma don’t want to be in Greece, the Greek refugees in 1923 did not want to be in Syria. They wanted to reach Greece, a country most of them had never seen but hoped would at least put them out of danger. In 2014, it’s obscene that refugees fleeing a brutal war should be sleeping on the streets of a European capital city. This is Europe’s shame and the Syrians deserve better. I spent just under two hours listening to the Syrian refugees on Syntagma Square on Sunday, where they’ve been sleeping out since last Wednesday to highlight the conditions they have faced since arriving in Greece. Most seemed anxious to tell their story, to have it recorded somewhere that their wife was killed in a bomb blast or to say that they have no idea where their families are. Or to explain how their sister has been in a Greek jail for six months on false charges of trafficking. And how her two children, who came to Greece subsequently, are now in a Greek orphanage and how their uncle had to battle to get to see them (he’s now allowed visit for an hour every ten days). Some of their stories I managed to include in an article entitled “Syrian refugees seek fresh start from Greek destitution”, published in today’s Irish Times, which you might like to read. More testimony from the Syrians is available on the Greek Crisis Review blog. 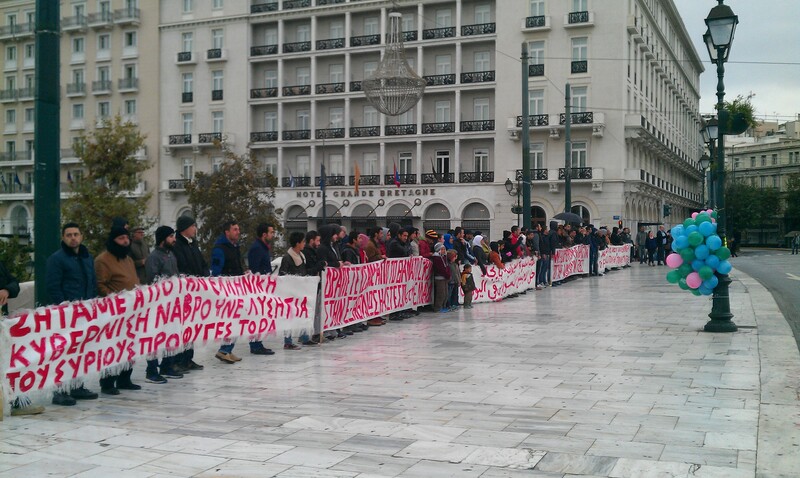 For the latest updates from the Syrian protest, follow #SyrianRefugeesGR on Twitter.